Home DIY Fashion	Japanese T shirt pattern to give your serger a workout! 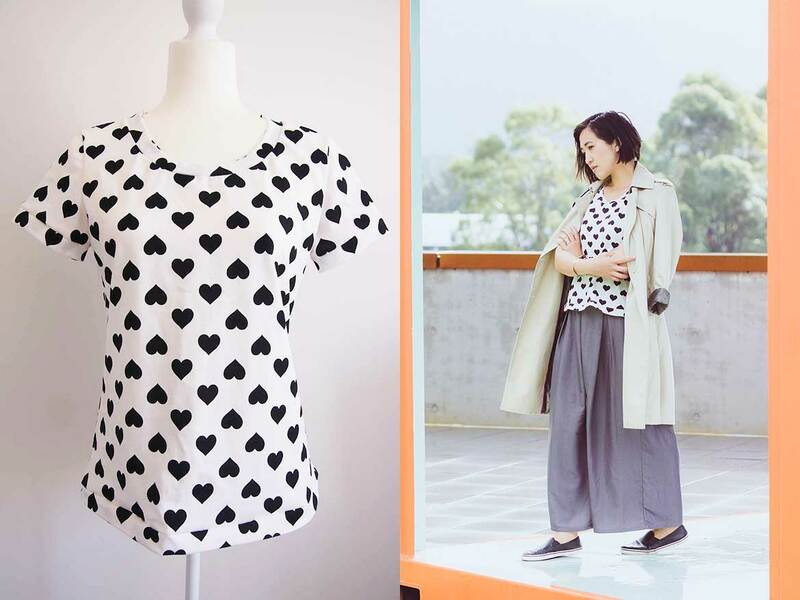 You would have seen this heart print tee on my blog post about my fall handmade wardrobe . I’ve been wearing it a lot, probably because the monotone print just goes with everything! So you might be confused, is it a serger or an overlocker? Being Aussie, I do call these awesome machines “overlockers”. 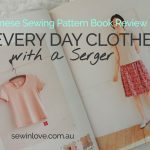 But seeing as though most of you guys are based in the US, I’m going to refer to it by the American English name, “serger” in this blog post. Fashionable Ways to Wear a Tee? Right now, I’m just so excited to be able to wear tee shirts again. Umi is going longer without the need to be breastfed, which means I can get out of the house wearing something other than button-up shirts. Hooray! The trick to dressing up your tee is to wear something with a collar on top. There’s nothing wrong with looking casual of course, but on the rare occasion where I go shopping in the city, or attend a meet-up, I like to make a bit of an effort. I’m wearing my handmade tee with a Banana Republic trench coat (secondhand from eBay), culottes from Japan, Dolce Vita slip-on sneakers and a Casio watch. This simple tee shirt is from a Japanese sewing pattern book dedicated to garments you can make with sergers. 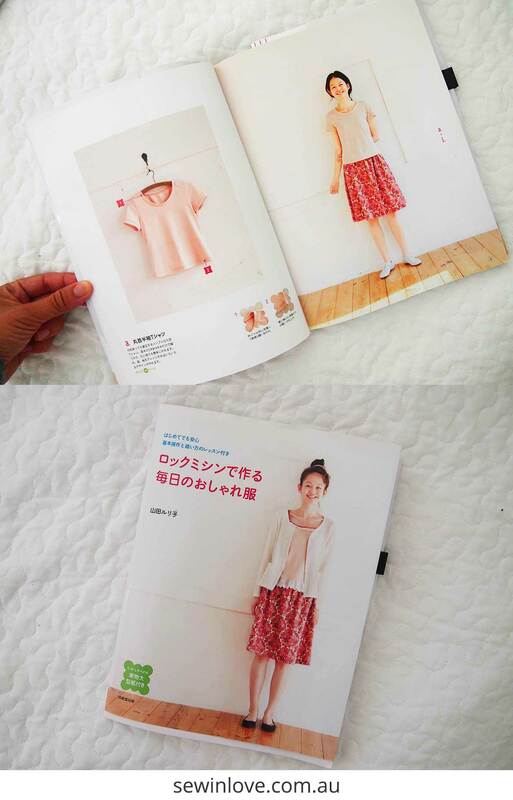 The book title translates to something like, “Stylish Everyday Clothes You Can Make on Your Serger”. I’ve gotta say, the designs in this book aren’t exactly stylish. They are better described as everyday basics. This is not a bad thing, however. I think if you’re keen on building a handmade wardrobe, it’s important to make some basic items as well as those pretty dresses for special occasions. I filmed a video review for this book, but it turned out ridiculously blurry. And there’s so much baby babbles in the background! I’ll have to shoot the video again – I’m so sorry it didn’t make it to this blog post! This is the first time I’ve made something where there was no sewing machine involved. And I loved it! It sews up so quickly and you have a cute tee in your hands in a matter of hours. 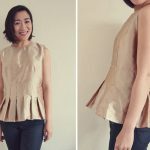 Before trying this sewing pattern, I never knew you could hem a garment using a serger. It’s so much easier than fiddling with a tri-fold hem on a sewing machine. This heart print fabric is from an Australian eBay store and I was pleasantly surprised to find out that the fabric was made in Australia. It’s such a great, mid-weight knit to work with – perfect for making tee shirts! Have you made a tee before? What’s your favourite T shirt pattern?